"I do not think that such portraits should grace the walls of the office of the first citizen of a forward looking, creative and diverse city like Bristol," Lord Mayor Cleo Lake said. A Lord Mayor has removed a portrait of a politician linked to the slave trade from her office and replaced it with the picture of an African-American woman. Cleo Lake took down the 'dull and dated' portrait of Lord Nugent from the walls of City Hall in Bristol. Painted by the artist Thomas Gainsborough, the portrait shows Lord Nugent holding a copy of the 1750 Act for the Regulation of the Slave Trade, which he helped pass through parliament. The Mayor has replaced it with a painting of Henrietta Lacks, whose cancer cells became the source of the HeLa cell line, and pivotal to modern medicine. 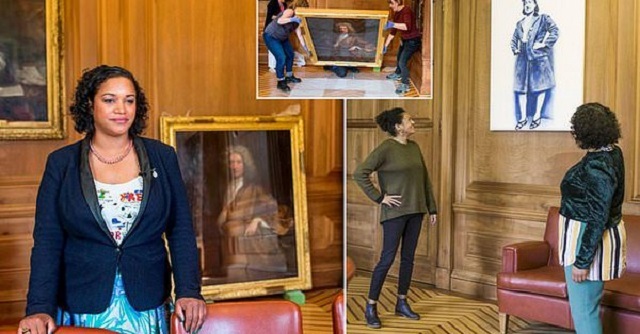 Earlier this year, the Mayor took down a portrait of the Bristol slave trader Edward Colston, whose ships transported nearly 100,000 Africans to the Americas. [...]She said: 'The portrait will be kept safe until such time it might be displayed elsewhere in a relevant context. 'I do not think that such portraits should grace the walls of the office of the first citizen of a forward looking, creative and diverse city like Bristol. 'They do not resonate anything positive to me personally and have no connection to who we are as a city today nor the vision for our future.